Although by 1910 Fifth Avenue was changing and millionaires had begun migrating northward along the park, Richard T. Wilson, head of the banking firm R. T. Wilson & Co. stubbornly stayed on in his mansion at No. 511 Fifth Avenue, at the southeast corner of 43rd Street. Forgotten today, Wilson was a major player in New York society at the turn of the century. The 80-year old financier summered in Newport and his five children had all been paired off in socially-prominent marriages. His son, Orme, married young Caroline Astor; Lelie Belle became Lady Herbert, wife of the former British Ambassador; Richard T. Jr. married Marion Mason of Boston; May married the fabulously wealthy Ogden Goelet and Grace became Mrs. Cornelius Vanderbilt. Part of Wilson’s property, separated by a service alley to the rear, was the mansion at No. 4 East 43rd Street. James B. Ford, a bachelor whose fortune was estimated by The Sun at between $12 and $15 million, lived in the house in the winter season. In the warm months he live mostly on his yacht, the Katrina. On November 26, 1910 Richard Wilson died in the house at No. 511 Fifth Avenue. His family soon discussed how to dispose of the valuable midtown property. The little ten-foot alley separating the two mansions was a problem. If the heirs could close up the gap, the entire corner lot could be sold as a much more valuable building site. The family tried in vain to eliminate the alley. Defeated, they sold the two lots separately. The survival of the tiny alley would make a marked difference in the structure that replaced the 43rd Street mansion. 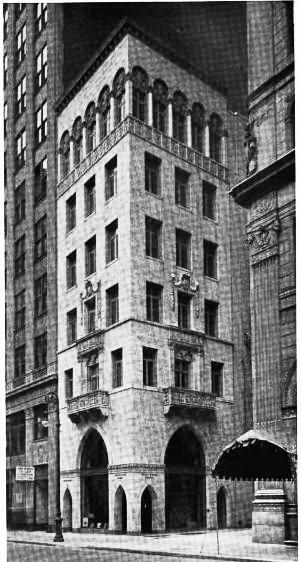 Finally on November 20, 1915, with James B. Ford still living in there, the sale of “the old four story residence at 4 East Forty-third Street,” was announced in The New York Times. Construction was already underway for a 16-story building replacing Wilson’s Fifth Avenue mansion. The 43rd Street house would follow suit soon. Klein & Jackson purchased the site for $150,000 and had already developed plans for a 6-story commercial structure. 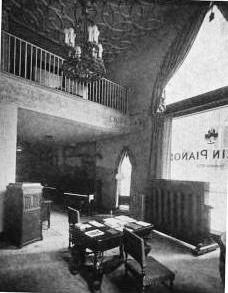 Andrew J. Thomas was commissioned to design the building with the principal tenant being the Mehlin Piano Company. Thomas outdid himself. In 2012 restoration of the neglected building neared completion. Clad in gleaming white marble and completed the following year, it was an Italian Renaissance beauty that took full advantage of the exposed western façade provided by the service alley. Mehlin’s showrooms were two-stories tall with a mezzanine that Thomas flooded with daylight by the inclusion of two double-height Gothic-arched show windows. These were flanked by matching entrance openings. Graceful Italian balconies graced the second floor and a columned arcade wrapped along the sixth story. Intricate carvings, including a frieze of cherub heads between the first and second floor adorned the dignified façade. Inside Thomas embellished the showroom with intricate plaster ceilings. A recital hall was included for concerts on the Mehlin instruments. On February 29, 1918, for instance, Florence Nelson gave a recital here. The singer had been devoting much of her time to the war-relief effort and had sung “in all the camps since the first weeks of the enlistment,” according to The Sun. The offices in the higher floors were leased to a variety of tenants, including the esteemed architectural firm of Hoppin & Koen. The architects were noted for their elaborate Beaux Arts mansions as well as monumental civic buildings like the Police Headquarters on Centre Street. Perhaps not surprisingly the Columbia University Club established its headquarters here. Other firms came and went, like the Harrison Granite Company which was here in 1925. Things were going just fine in 1961 when the law and accounting firm of Goldstein, Lewis & Lubell took office space in the building. But then things went wrong. After the turn of the 21st century the building was inexplicitly abandoned. Boarded up (and in some areas cemented up) the gracious marble façade sat for years deteriorating and abused. The cherubs and balconies eroded from pollution and neglect and large cracks developed in the stone from lack of maintenance. The balconies are severely eroded and the carvings--like the festoon-holding cherubs above the window--have lost their faces and details. Then in June 2012 the firm Van Pok & Chang purchased the building for $6.3 million. While the deteriorating building could have been easily razed and replaced, the company, owned by Omega Chang, a real estate investment firm, announced it would restore the exterior and renovate the structure as a boutique hotel. The make-over is expected to cost over $2 million. The band of chubby-cheeked cherubs is barely discernable. The little marble gem that The New York Times in 1922 called an “architectural masterpiece” has been saved from what was an almost assured demolition. Beautiful looking building... I hope for preservation's sake that the hotel dream materializes. Well kudos to Omega Chang for their thoughtful decison to restore the facade. It will make an elegant small hotel. This property did not become a boutique hotel. As of 2016 it is operating as a retail wine shop by the name of Langford's.